The first Indianapolis Coffee Meet Up was a success! We had a total of 6 participants. We tasted 3 coffees from Stanton Coffee Roasters. All of our coffees were roasted on Monday October 16. Nice and fresh. Since the coffees were so fresh we enjoyed them brewed using the French press. We started off with Guatamal Huehuetenago, then we had Mexico Tres Oros, and we ended the evening with Daterra Sweet Yellow Bourbon, from Brazil. 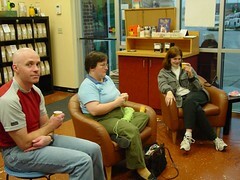 We had snacks, conversation and Coffee! What else do you need of a fun evening with new friends!